As I have mentioned, this year has seen some unusual variations in handbags, including stripes and mini bags. There is a third trend that I think is even more odd: handbags with eyes on them. Here is a illustration of the look, used to promote one manufacturer’s products this year. The woman is attractive, nicely dressed and wearing big cool sunglasses. And she is carrying a purse with eyes on the on the front flap. If this were a one-off, I guess I could get it. But no. But there are lots of eye-bags out there this year. Where, oh where, I wondered, could such an idea have originated? Then I remembered several years ago when the handbag “charms” thing was getting going. The charms were the grown women’s equivalent of the cute little stuffed animals that primary school students attached to the zippers of their school backpacks. The adult charms included the gold MK plates that came with Kors bags and, at extra cost, with other houses’ premium attachments: little horses, miniature fruit pieces, leather tassels and plasticine jewels, among others. It was a look that could be and often was overdone. Its popularity probably has crested by now. But I digress. The point is that the house of Fendi’s 2014 bag charms included expensive little fur ones, mostly distinguished by eyes. I have never seen one of these on the street, but many fashionable people undoubtedly did. My impression is that these are being marketed even today. So maybe Fendi started the eye-bag thing. Whatever. What is significant to me is that many companies are selling handbags that seem to be staring across the street. Let me share a few. The bag below was priced at almost $1,500 and sold out. Below, from the same designer, is a similar look, this time in a larger bag that might hold a laptop computer and work papers. It’s whimsical and maybe fun, but I wonder what the reaction would be if a professional woman carried it into a client meeting. And here is a backpack with eyes. Interestingly, the same bag, also with eyes, was marketed in black shearling. I can see how a handbag with eyes could work as an attention-getting thing. Say you carried one into a bar or to a church social, and a man was interested in striking up a conversation. His opening comment would be the obvious one — “That’s an unusual handbag you are carrying” — and the discussion could proceed from there if you found each other agreeable. On the other hand, if you were a relative of mine and visited one of my siblings with such a purse, the first thing you would hear would be, “What the hell is that?” The mirth would continue through dinner and be mentioned again and again for years to come. This year, an Italian designer came up with bag featuring not just eyes but a full face and fringe hair. The design house even showed how the bag would look with a coordinating outfit. Remarkably, this was being marketed in Paris, of all places. Finally, from California, are some eye-laden sneakers from a youth fashion house. Its products this year are mostly thick-soled sneakers in various colors and designs. For this firm, an eye-oriented design makes perfect sense. The good thing, for buyers, is that these shoes only cost about $100. If you wear them out or, more likely, the eye thing ends in a season or so, you will not feel required to hold for the shoes for years in the hope that there will be a retro-eye revival. Like so many fashions, the eye-look has been copied by Asian knock-off houses. Here is a bag that looks a bit like the famous Hermes Birkin, but with eyes and a price that is considerably — and suspiciously — lower. I’m thinking Hermes won’t be putting big eyes on its bags anytime soon. And here is a less polished effort. My guess is the manufacturer reasoned that if two eyes is good, six eyes is better. Most unfortunate. The Asians also seem to have taken the eye thing further, into clothes. 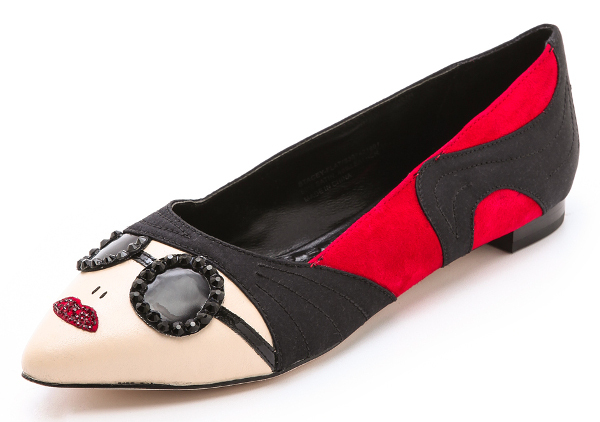 And here is an unusual and possibly charming Asian shoe variation — flats with eyes that are winking. You will have observed that I view this eye thing with skepticism. You may take a different view. But if you like the look and want to give it a road test, why not start slowly? Buy a cloth patch like the one below and paste it onto a purse or a jacket or another accessory. Live with it for a while. Then you’ll know whether to splurge on an autumn bag with eyes on it.